New Car Scent puts a smile in the air. The Little Joe car vent air freshener is designed with a clip that enables the scented Little Joe to be fitted to any A/C air vent to release fragrance uniformly into a car for long lasting freshness. 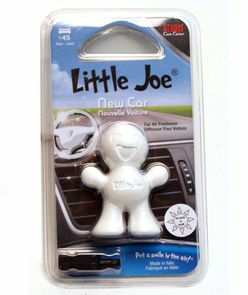 Unlike many hanging air fresheners, the Little Joe scent never seems to overwhelm the car even when opened for the first time. It was developed and produced in Italy in collaboration with some of the world's best fragrance houses. It contains an alcohol-free fragrance oil that works to minimize unpleasant odors in vehicles. It is made of a non-hazardous, non-toxic plastic.